The headlines sure sound exciting, but hang on: Skype's long anticipated Android debut is no cause for celebration. Skype, in case you haven't heard, unveiled its platform-wide Android app on Tuesday. The program promises to open the door to full Skype-based communications from your Android phone, ranging from Skype-to-Skype chatting to cheap and easy calling. Fantastic, right? Not exactly. Despite its promising appearance, Skype's first stab at Android is a convoluted mess of unexplained options and unreasonable restrictions. • Skype for Android comes in multiple flavors. If you search the Android Market from a Verizon-powered phone, you'll find two different variations of Skype's mobile application. The reason: Verizon introduced its own edition of Skype for Android back in March. That edition is listed as "Skype mobile," while the new platform-wide edition is listed as "Skype." Both are billed as being full-fledged mobile Skype solutions; most users will have no idea which one they should get. • Both Skype for Android editions restrict how you can place calls. The Verizon version of Skype's Android app works only over 3G; Wi-Fi is not supported. The new non-carrier-specific version of the Skype app, on the other hand, works only over Wi-Fi within the U.S; 3G is not supported. • Making domestic calls through Skype might still count against your minutes. 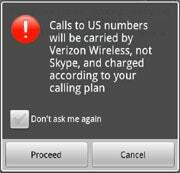 The Verizon edition of the Skype Android app doesn't support domestic calling over Skype; if you try to place a call to a U.S. number, you'll end up using minutes from your Verizon plan. The new non-carrier-specific version -- from what I can tell -- does actually let you make domestic calls using only Skype credits. So at least that's something. • It's Skype -- but there's no video chat. How could a service like Skype come out with an Android app and not include video calling functionality? As of now, neither edition of the Skype mobile program has the feature. There's no nice way to put it -- that's just weak. • The Skype for Android app is freakin' huge. Skype's platform-wide Android app takes up anywhere from 13 to 16MB worth of space on your phone, and the program doesn't even include an option for SD card storage. If you have limited space on your phone's internal memory, prepare for problems. • Some major Android phones aren't supported. Skype's new app doesn't yet support the Samsung Galaxy S line of phones -- you know, the device that's available in some form on every major carrier in America. Minor oversight, I guess. • The Skype Android app may not even work at all. Even if you're able to get past the hurdles and get Skype's Android app installed, you may not actually be able to use it. 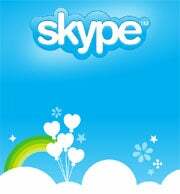 As of Tuesday afternoon, numerous users are experiencing problems logging in to Skype through the newly released application. In these instances -- which, gauging by the comments in the Android Market, are becoming increasingly common -- the program immediately returns a "Can't sign in" error every time a username and password are entered. There's no way to get around the error; even the "Create new account" option fails to work. All in all, it's a disappointing start for Skype in the Android realm. Hopefully the company will figure out a way to deal with its various business needs and technical issues without creating such a subpar user experience. Thankfully, there are plenty of alternatives available.